A mutual fund from Parnassus Investments, comprised exclusively of companies with outstanding workplaces, has given a 9.63 percent annualized return as against an overall S@P index of 5.58 during the same period. Investing in workplace happiness ensures organisations stay on top. Space is, and can be used as a starting point for innovation. But are we? Across several decades, test after test in social science has shown that when humans are given a simple set of rules to solve a problem, with a clear destination, productivity is at an optimum due to sharpened singular focus. This worked very well in the shop floor, where productivity could be easily measured in terms of number of units produced. 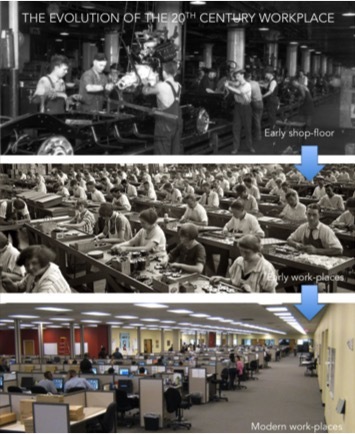 The modern day workplace of the 20th century was a natural extension of the shop floor. The kind of work humans did mostly had clear set of instructions and more or less clear goals. A hierarchy was established in workplaces, where managers managed these tasks through subordinates. A carrot and stick approach was adopted where rewards were based on measurable output. The workplace layout itself has been representative of this linear thinking. Smaller workstations>Larger workstations>Cubicles>Office>Corner office. In the 21st century, most of the work that humans do is ‘non-linear’. Nearly all of the white-collar worker’s process oriented work has been taken over by machines. Across shop-floors, a lot of the blue-collared workers’ work has been taken over by robots. Today, problem solving for humans usually means an unclear set of rules and the solution, if it exists, is hazy. While machines have taken over the ‘left brained’ process oriented work, humans mostly do right-brained work which requires creativity and cognitive skills. Linear thinking does not work in the 21st century. A carrot and stick approach does not work in right-brained work, as it blurs creativity; the solution is not at the end of a clear set of instructions, but somewhere in the periphery. Humans work within a space, and the work environment has a profound impact on human psychology and hence on human creativity. 20th century workplace design does not work well to augment human creativity. Add to that the fact that, thanks to technology, people ‘do not need to come’ to work; they carry their work in their pockets. Retail bank in the conventional form is dying as consumer banking has moved online. Similarly, organisations face a huge challenge of attracting talent to ‘come to work’ and then to retain that talent. The very understanding of work itself is very different today than it was two decades back. 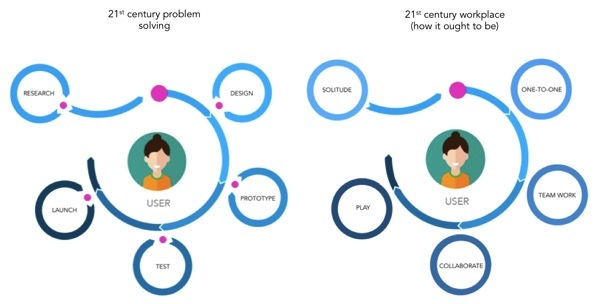 The 21st century workplace need to be reflective of this; if the solution in problem solving is to be found at the periphery, you cannot expect such thinking to emerge from cubicle farms. The aspirations and needs of the modern day worker are very different and workplaces need to be an eco-system of blended spaces where people can transition from solitude to team-work seamlessly. If one is relatively more productive from one’s bedroom or a coffee shop, well, you need a bit of that at the new workplace as well.